Two nuns, Sister Mary Agnes and Sister Mary Vincent, are traveling through Europe in their car, sightseeing in Transylvania. As they are stopped at a traffic light, out of nowhere, a small vampire jumps onto the hood of the car and hisses at them through the windshield. "Quick, quick!" shouts Sister Mary Agnes, "What should we do?" "Turn the windshield wipers on. That will get rid of the abomination," says Sister Mary Vincent. 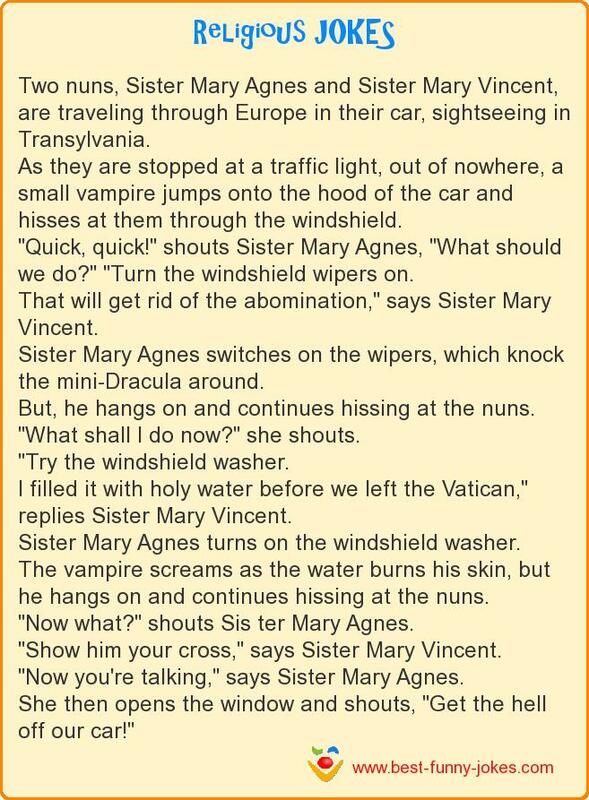 Sister Mary Agnes switches on the wipers, which knock the mini-Dracula around. But, he hangs on and continues hissing at the nuns. I filled it with holy water before we left the Vatican," replies Sister Mary Vincent. Sister Mary Agnes turns on the windshield washer. The vampire screams as the water burns his skin, but he hangs on and continues hissing at the nuns. "Now what?" shouts Sis ter Mary Agnes. "Now you're talking," says Sister Mary Agnes. She then opens the window and shouts, "Get the hell off our car!"